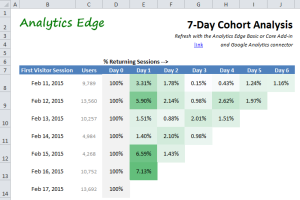 This free Excel report from Analytics Edge works with the free Basic Add-in and Google Analytics connector to mimic the 7-day Cohort Analysis report provided in Google Analytics. 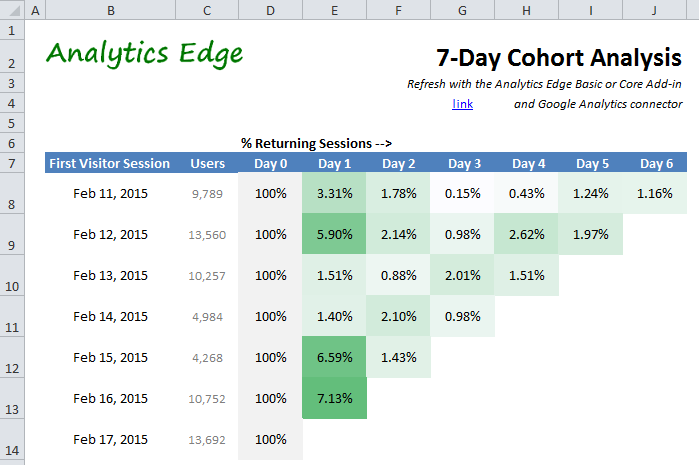 Using embedded queries with dynamic segments, the report shows how many of your new website visitors returned to your site over each of the past 7 days. Use the report as-is to gauge short term campaign effectiveness, or use the technique in your own custom analysis. A companion Help article shows how to make a 12-Month Cohort Analysis and includes a sample report.